I’ve spent a lot of time writing about how to get the most out of your living space, particularly in terms of how choosing the right accessories can deliver stunning style statements. Chairs, beds, tables, chess sets and the right lighting all factor into what the style magazines call ‘bringing a room to life’ – which would be quite scary if you took it literally, but that’s another thing! Anyway, what I want to say today is about how you can’t just do one thing on its own and think that you’ve cracked it. You can’t. All the pieces of the jigsaw have to fit together. So however striking your favourite vase might be, if its shouting 1960s in a room that’s trying to quietly to introduce itself as something a little more contemporary you’re going to have a stylistic jumble, or worse still a clash. And jumbles and clashes aren’t good. In just the same way that colours and patterns clash, the dating and the styling of 3D ‘objets’ can also go badly awry. The danger is that you grow attached to particular items and that level of sentimental attachment can blind you to the overall effect you’re creating. We’ve all seen people who like a particular colour to the point where they ignore anything else that might be going on. The trick is to be aware that interior design can go the same way. A great way to keep everything in balance is to go with the tone of the permanent features of the room, whether that’s contemporary window frames, trendy internal oak doors or a more retro set of fittings. After all, those ‘big ticket’ features aren’t going to be the sort of things that you replace every few months – especially the windows and the doors. For instance, if your doors and skirting boards are in an oak tone consider opting for traditional styles when it comes to soft furnishings and accessories. ‘Traditional’ doesn’t mean you can’t have modern features but you’ll probably find that minimalist, chrome designs don’t work as well. When it comes to interior design, it’s all about working with what you have and enhancing it. So if you really want your pied a terre to make a statement, you really need all the different elements that go into it to strike the same tone. That’s why all those magazine shots all look so great. It’s not just that there’s something lovely and shiny in the foreground. If you look closely, you’ll see that everything fits together as a unitary stylistic entity: floors, doors, windows and sofa throws, they all fit together as a piece. 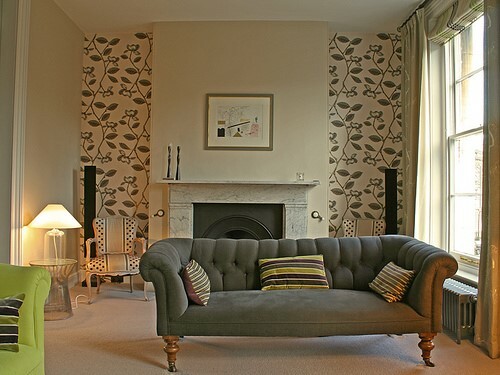 There is a lovely quote from William Morris (the wallpaper man), who knew a thing or two about interior design. It goes like this: “Have nothing in your house that you do not know to be useful, or believe to be beautiful”. It’s a lovely quote and it’s right in all sorts of ways. So it makes me a bit sad to admit that there is a bit more to it than that. I think what it should say is something like, “Have nothing in your house that you do not know to be useful, or believe to add to its beauty.” That way, you won’t end up with a ramshackle collection of beautiful bits and bobs that taken together look like a jumble sale. ‘Jumble sale’ is not a look that’s going to impress anyone! To create your domestic dream you really do need a room with a theme.